Easter is right around the corner, and we’re psyched. 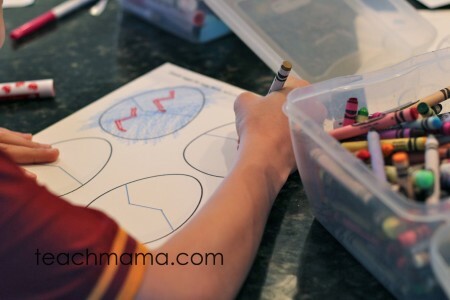 Not only does Easter mean egg painting and candy, family time and spring flowers, fresh starts and new hope, it means my kids get to spend some time with faraway cousins. Maddy, Owen, and Cora are thrilled to see their little cousins who are much younger than they. My kids are 10, 8, and 7 years old, and their Pennsylvania cousins are 3 years, 19 months, 12 months, and 4 months old. So this year, as we relaxed a bit after a whirlwind Disneyland adventure (more on that later! ), the kids put some time into a little homemade gift for their Keystone State cousins. 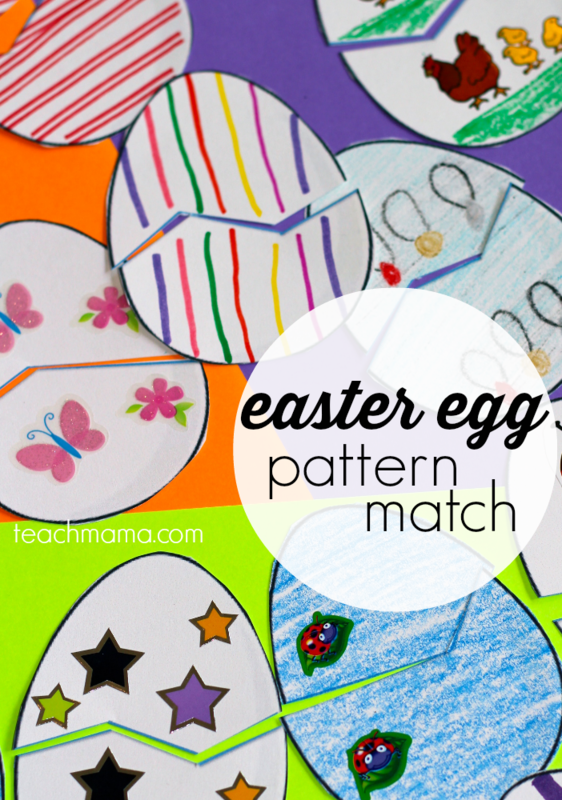 We worked together to make Easter Egg Pattern Match–a super-fun, made-with-love game for their 3-year-old cousin. Matching. Patterns. And really? 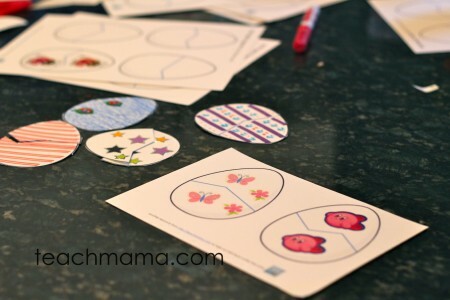 Creating matching patterns was a fun mathy, brain-stretching exercise for my own kids. These eggs are simple but full o’ love. 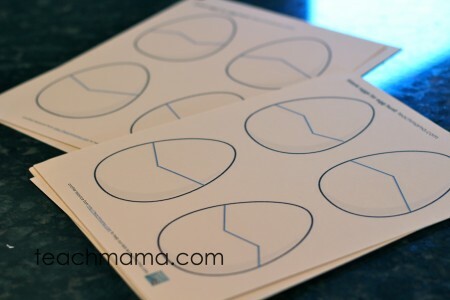 All I did was print out Blank Egg patterns, much like our Alphabet Egg Hunt–Uppercase and Lowercase Letter Match set but obviously without the letters. I printed the eggs out on white cardstock, which I highly recommend so they are a bit more sturdy. 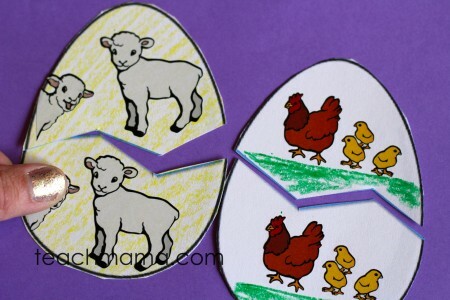 The BLANK alphabet egg hunt are here to download if you’d like. Just sign up below! This afternoon, after our third tv show and hundredth game on the iPad, I asked the kids to meet me at the counter. 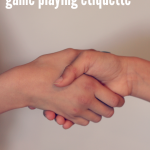 I said, I found a really cute game that we can make for our cousins and bring to them at Easter, and I think you’ll love it. Who wants to grab a marker, crayon, and some stickers and give me a hand? They were all game, even though it was 2pm and we were all still wearing pjs. 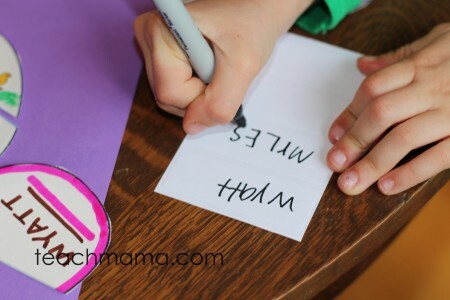 We’re going to make a matching game for Wyatt–matching is a super-important skill for 3-year-olds, and you know what? If Wyatt knows that his cool older cousins made him a game, I’m betting he’ll love playing it. 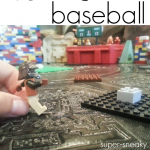 So here’s the deal: just like the Alphabet Egg Hunt where we matched uppercase letters with lowercase letters, this game will be similar. But instead of letter matching, we’ll make patterns that match. 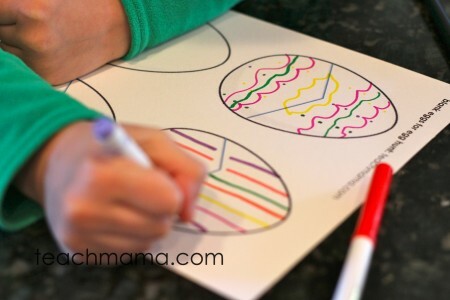 Your challenge will be to create matching tops and bottoms for our eggs, like this: (I showed them two really simple eggs I did, each with one sticker on the top and bottom half of the egg. The pattern-making and designing matching eggs proved to be a bit difficult for Cora, but even Maddy and Owen each had one ‘do-over’ egg. Sometimes they made eggs that just mirrored the pattern, and sometimes the pattern wasn’t clear after the egg split–it didn’t start low enough. 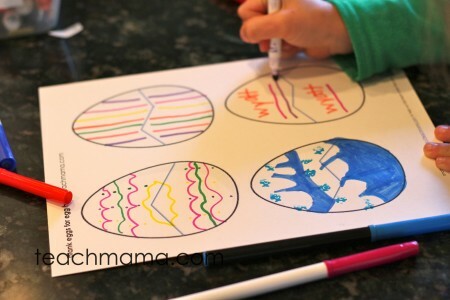 We wanted to have several eggs that had the same colors, basic shapes, and same layout so that our little loves would have to look just a tad bit closer. 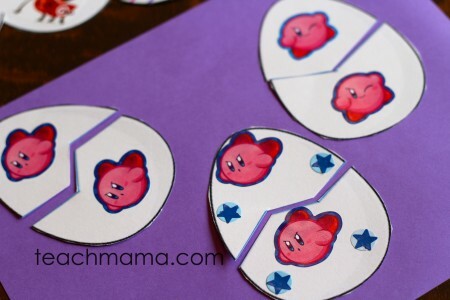 We didn’t want to totally frustrate him, but we thought that his name and his brother’s name, written in similar colors, and stickers with similar shapes, or even two with farm animals or vehicles would give him an extra challenge. And after we were finished with all of the eggs, Cora and I matched them all up to make sure they worked. We checked patterns and we checked them again. We eliminated some that didn’t work, and we included only the best. 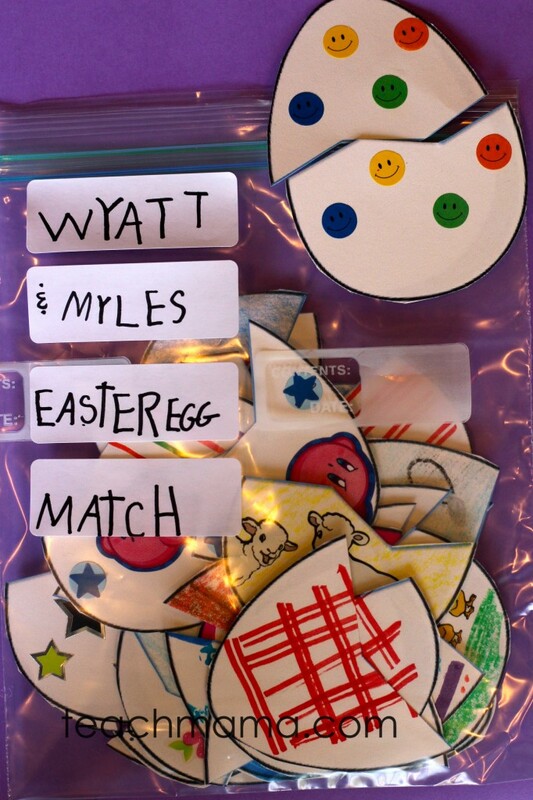 Then Cora made a label: Wyatt & Myles Easter Egg Match. We threw the eggs in a plastic baggie, and we were ready to roll! The kids cannot wait to play the game with their cousins! 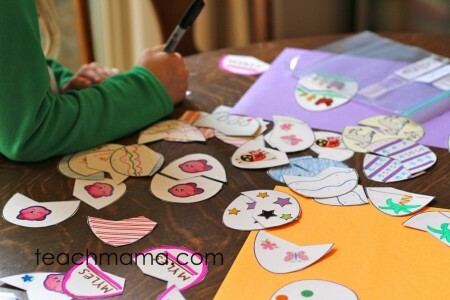 Love these little ways that empower kids to create and teach other little ones. The pattern-making and generating of top and bottom matches was a great brain exercise for my three spring breakers! 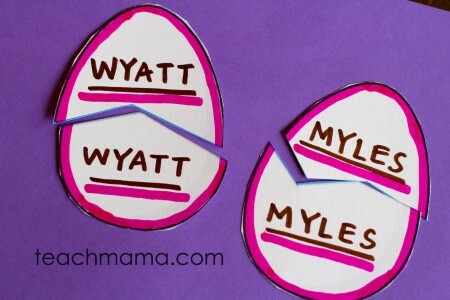 Just a quickie little something you can print out, bring to your Easter gathering, and have cousins, siblings, aunts, uncles, and friends create for the little ones of the crew! Will these work for you? Let me know how your family will use them! I’d love to hear it! 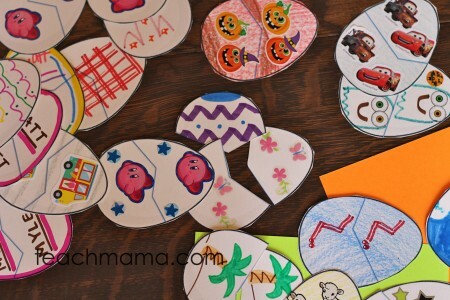 Want a few more fun easter ideas? Wowwww! A very funny idea! Thanks for sharing!